“Everyone knows that moving is one of the most stressful things a person or family can do, which is why you want an agent who is experienced, well connected, and blends an easygoing demeanor with a passion for his work. That’s Jeff Lovell. I doubt we were the most troublesome clients Jeff ever had but we certainly weren’t the easiest. We had concerns. We knew we were going to have to sell our house before we could afford a new house. We had a toddler and a baby on the way. We had elderly in-laws who were going to move in with us. There was a lot on the line. Could we get the maximum for our house and turn around and find a new home that fit all our needs? We had questions. Should we turn our old home into a rental? Where were the best school districts? Should we do a lease back with the new owner if we couldn’t find a new house in time? And we had fears. What if we didn’t get our asking price on our house? What if we couldn’t find a new house in time? Should we look at apartments? met us with anything but high spirits and a positive attitude. There were days I would call and want to see 5 houses 25 miles away, (no easy drive in L.A. traffic) and yet, Jeff would somehow make it happen. Once we were in escrow on the sell of our house, Jeff fought for us on every issue. He got us a lease back at a ridiculously low rate and we managed to stay in our home for a full 30 days after escrow closed, playing less to the new owner than we were paying on our mortgage. And when we found a new house he fought for us again, unsatisfied until he was sure we were getting the very best possible deal. And while we don’t plan on moving again for at least another 20 years, Jeff is our first call whenever we have real estate related issues. He doesn’t quit working for you when the last contract is signed. 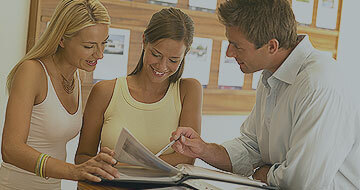 I doubt you will find many agents so committed to their client’s satisfaction.